A little more than a week into my Lenten practices and it's still going well! In my efforts to let go of "Stuff" my kitchen has never been cleaner or more organized. Whenever I walk into or through my kitchen I feel a little thrill of accomplishment and satisfaction. And with a nice clear palette to start from, it's been easier to keep it uncluttered. Just tackling one small area each day has been key for me. I don't get overwhelmed when the job is just a handful of kitchen drawers or only the pantry. As another bonus, I reorganized so that my kids can reach the appliances they use most often, like the toaster, without climbing up on the counters, and they can also find a sharpened pencil when it's homework time. I discovered stuff I needed to use up and placed it prominently where it'll actually get used. I cleaned the counter my microwave sits on, folks. That was icky. 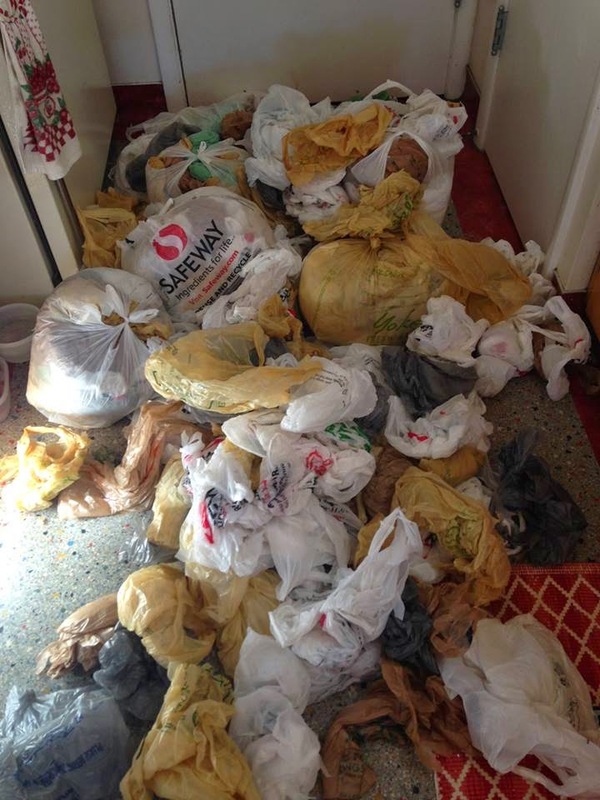 I use plastic grocery bags for a myriad of purposes including as garbage bag liners, collecting food scraps for our compost pile, as trash bags in each vehicle, to pick up dog poop (when we had a dog), packing material, but even with all those ways to use them I unearthed way more than we could ever use. So I put out a call to my facebook friends for ideas and got some great ones! * Check at Wal-mart or local grocery stores for a recycling collection point. * Weave them into a rug (one example here). * Donate them to a local animal shelter or dog park. * Donate some to a daycare or elementary school (for wet clothes after those inevitable accidents!). * Check with your local food bank to see if they need some. * Local thrift stores may also need them for shoppers. And as for the other part of my Lenten focus this year, I'm really enjoying Yoga with Adriene. I've worked my way through her Foundations of Yoga series, short videos that focus on different yoga poses, and I've started her new 30 Days of Yoga. I appreciate her "ease-in" approach and the variations she offers for people of all strength and flexibility levels. I've been surprised how easy it's been for me to get up early (most days) to do yoga. My husband will attest that I'm not a morning person, but - at least for right now - laying in bed drowsy doesn't hold the same appeal as getting up and getting going. My posture has been much better this past week, I've noticed. I'm more aware, especially when sitting at the computer, of when I'm slouching or slumping or hunched over and more conscious of where I'm holding tension or stress (usually my neck and shoulders!). And when I'm aware of it, I can do something about it. ...in an era in which teenagers make six-figure decisions about college and five-figure ones about how much student-loan debt to take on, the greatest act of protection we can commit is to talk to our children about money a lot more often. ...Allowance amounts can vary, but here’s the big idea: Give your kids just enough so that they can get some of what they want but not so much that they don’t have to make a lot of difficult trade-offs. Let them own those, so they know what it’s like to make financial decisions that resemble grown-up ones. ...Once you know the entire budget, hand it over in a lump sum. Do the same for athletic equipment, musical instruments, art supplies, and anything else you’ve deemed a need. Then, stand back and watch them fail spectacularly. No bailouts; you should want them to feel their mistakes deeply and earn money to solve their problems if need be. Better now than at age 24, when errors lead to wrecked credit scores and worse. This is similar to the Love and Logic approach. Allow small failures while kids are young to help them learn the lessons that will prevent the bigger, more expensive, more dangerous failures when they're older and the consequeneces are more severe.